Varanasi or Banaras is one of the oldest cities of India. This city has found place in the Buddhist scriptures as well the epic of Mahabharata. In Pali language Varanasi was called Banarasi hence it got the name 'Banaras'. 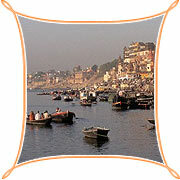 Varanasi is also called 'Kashi' or the city of spiritual light. Kashi is the place where Shiva and Parvati stood when the "time started ticking". This ancient city of India is located on holiest river of India--Ganga. This relation is unique and has attracted thousands of pilgrims. One theory also goes that Varanasi is located on the land between the river Varuna and Assi hence the name Varanasi. This town also has its place in history with many events and incidents being related with it. From time immemorial Varanasi has been the center of education, religion, art and culture. 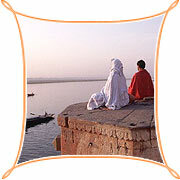 For every visitor Varanasi has different experiences to offer. The shimmering red and golden water of the Ganges when rays of dawn falls on them, the high banks, the temples, the Ashrams, the pavilions all are an experience in themselves. Chanting of Mantras, the hymns along with the fragrance of incense in fills the air with mysticism which entrails every person. The refreshing dip in the Ganges with the splashing of water along the ghats-- in Varanasi discovery and experience takes to the ultimate bliss. Not only for its temples, Ghats and Ganges Banaras has produced many exponents of art, music, literature and crafts. These people were not different from others but it was the tradition of Banaras which moulded them in the way they came out to be. Why only the luminaries, Varanasi has excelled in the art of silk weaving. The Banarasi silk sarees and brocades are cherished as collector's items across the world. As a eternal city with rich and vibrant past, it has no exquisitely carved palaces, no impregnable fort no architectural splendour but still the city has an inherent charm of its own. The Kashi Vishwanath Temple : This temple is dedicated to Lord Shiva. It is popularly known as the golden Temple due the Gold plating done on its 15.5 meter high spire. One tonne of gold donated by Maharaja Ranjit Singh has been used in the gold plating of the spire. The temple was destroyed in the various invasions and was rebuilt in 1776 by Rani Ahilyabai of Indore. The Ghats Of Varanasi : In this ancient city of pilgrimage, the bathing ghats are main attraction. People flock here in large numbers every day to take bath and worship in the temples built beside the river bank. Centuries old tradition to offer puja to the rising Sun is still maintained. Bharat Kala Museum : The Kashi Hindu university has a museum which has a very rich collection of precious and rare historical artifacts, statues, pictures, paintings and manuscripts. This small but very well maintained museum gives an over view of the ancient city of Varanasi. Entry in the museum is free but check out the timings. Benaras Hindu University : This is the largest and oldest university in north India. Spread over an area of 2,000 acres, this great place of education was established by Pt. Madan Mohan Malaviya. Today the campus has faculties of Arts, Science, Music, Sanskrit, Languages, Engineering, Statistics and Medical to name a few of them. Rail : Varanasi has two railway stations-Kashi and Varanasi Junction (also Cantonment Station). We would provide you all India tourist permit vehicles for the local transportations and also for the intercity drives too. Road : Mathura is well connected by road with all major cities.